Discover your collection, and play on at least 3 different tables! Advance a rank and become a Jedi Padawan on the Light side or Sith Adept on the Dark side. Get your friends together and earn 10000 Team Score! Rise to prominence by becoming a Jedi Master on the Light side or Sith Master on the Dark side. Have the highest Force Score among your friends and become the Master of the Force! Keep playing hard, and earn a score of at least 150 million on any table! Feel the Force and show off your pinball skills by earning 2000 Force Score! Rise to the challenge and beat the score of a friend ahead of you on any table! Dominate your friends and beat ten of them on any table. Win an Online Multiplayer race against 3 other players. Complete all of the Empire's special assignments on the Boba Fett table! Complete all of the Hutt Cartel's special assignments on the Boba Fett table! Earn maximum respect, and escape from the Sarlacc on the Boba Fett table! Win a fight against an AT-AT walker on the Star Wars Episode V table. Get an award from master Yoda on the Star Wars Episode V table. Start Jedi and Sith multiballs at the same time and score a Balance Jackpot on Star Wars Episode V table. Transport at least 3 clone troopers to Point Rain on Geonosis on the Clone Wars table. Earn the highest rank by completing the clone training several times on the Clone Wars table. Purge the galaxy by defeating both Sith Lords on the Clone Wars table! Repair the ramps before the time runs out in the Bombardment mode on the Star Wars: Starfighter Assault table. Start the Barrage Frenzy, and the Fleet multiball at the same time on the Star Wars: Starfighter Assault table. Complete all Squad Missions in one game on the Star Wars: Starfighter Assault table. Destroy 6 targets in the Target Drill mission on the Star Wars: Darth Vader table. Lock 3 balls and start the Tractor Beam Multiball on the Star Wars: Darth Vader Table. Destroy 3 rebel bases on the Star Wars: Darth Vader table. Get a Jabba award on the Star Wars: Episode VI table. Where is that shuttle going? Start the Tydirium multiball for the first time on Star Wars: Episode VI table. Complete all the Scene modes on the Star Wars: Episode VI table. Successfully hack the terminal in the R2-D2 minigame on the Star Wars™ Pinball: Droids™ table. Have the Ore Processor and Magnet Crane multiballs running at the same time on the Star Wars™ Pinball: Droids™ table. Complete the 5 main missions and start the Wizard Mode to help R2-D2 and C-3PO escape the sandcrawler on the Star Wars™ Pinball: Droids™ table. Hit a Greedo target in the Cantina minigame on Star Wars™ Pinball: Episode IV A New Hope table. 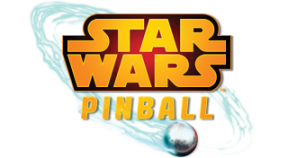 Complete a Training mode on Star Wars™ Pinball: Episode IV A New Hope table. Great shot, kid. That was one in a million. Complete the final mode and defeat the Empire on Star Wars™ Pinball: Episode IV A New Hope table. Emerge the third bumper and make enough bumper hits, then enter the asteroid field on the Star Wars™ Pinball: Han Solo table. Hit all targets in the Mos Eisley cantina to meet Greedo on the Star Wars™ Pinball: Han Solo table. You've never heard of the Millennium Falcon? Achieve less than twelve parsecs in the Fastest Hunk of Junk mode on the Star Wars™ Pinball: Han Solo table. Turn completely to the Dark Side by finishing only Dark Side tasks on the Star Wars™ Pinball: Masters of the Force table! Turn completely to the Light Side by finishing only Light Side tasks on the Star Wars™ Pinball: Masters of the Force table! Complete all fights and bring balance to the Force on the Star Wars™ Pinball: Masters of the Force table! Find your first Imperial helmet on the Star Wars™ Pinball: Star Wars Rebels™ table. Duel with the Inquisitor on the Star Wars™ Pinball: Star Wars Rebels™ table. Lock four balls with the Force on the Star Wars™ Pinball: Star Wars Rebels™ table.